Alfie enjoys a Guinness (World Record Attempt) over Easter Weekend! 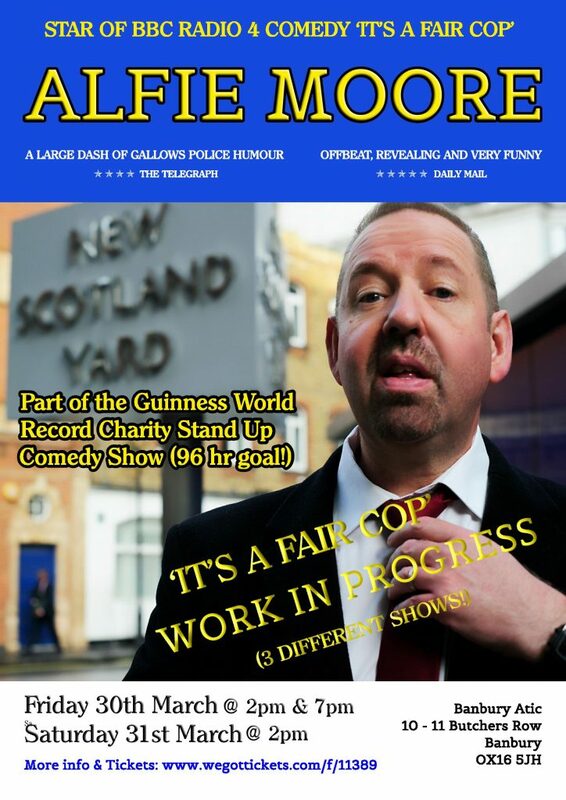 Alfie Moore is delighted to be taking part in an attempt to break the official Guinness World Record for ‘Longest Running Comedy Show’ this Easter weekend. The current record, set in America in 2015, stands at 80 hours. This audacious record-breaking attempt is planned to run for 96 hours straight – from 6pm on Thursday 29th March 2018 until 6pm on Monday 2nd April 2018. Alfie will be one of a diverse range of performers, including ‘TV names’ and headlining comedians from the comedy circuit, contributing to the fabulous line up. He says “I’m very excited to be involved in this world record attempt for such a great cause. I will be performing 3 completely different one hour shows in 25 hours so if you’ve enjoyed my BBC Radio 4 comedy series ‘IT’S A FAIR COP’ (or even if you haven’t heard of it YET!) then please come along and lend your support to this fantastic effort”. Alfie’s shows will be at 2pm and 7pm on Friday 30th March 2018 and 2pm on Saturday 31st March. Whether you want a £15 Weekend pass, a Day ticket for £5 or a Pay as You Go £3 ‘on the door’ just get your laughing gear on and help us make comedy history! Monies raised from the event will be donated to Katherine House Hospice.